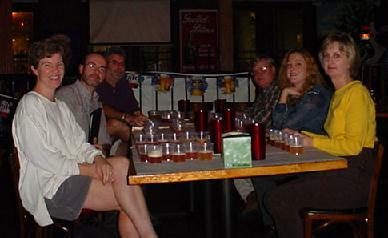 Owen Ogletree (director of Brewtopia Events) gathered together some of his fellow beer lovers in late November of 2001 at Athens' Wild Wing Cafe to sample and comment on several styles of wheat and golden beers. This beer sampling was done as a blind tasting where no one was aware of the brands that were being served. Beers were informally commented upon and ranked according to American Homebrewers Association (AHA) style guidelines. First, second, third places, and honorable mention were awarded to the beers we felt represented their individual styles in extraordinary fashion. Drop Owen an email to share your comments and opinions. Wild Wing Cafe in Athens, GA is a fantastic place to try great beers from around the world. Below are the participants in this blind tasting. LtoR: Lynn Gieger, Owen Ogletree, Dean Graves, Lari Cowgill, Kerri Allen, and Gail Graves. Aroma: Fruity, honey, jelly preserves. Appearance: Very pale in color with nice white foam. Flavor: Dry, clean, fruity, tart, refreshing, citrus. There is no hop flavor, only dry sourness. This is a remarkable, complex, yet refreshing beer. Appearance: White, glowing, cloudy, very attractive. Flavor: Dry, creamy, citrus-like, spicy, very nice. 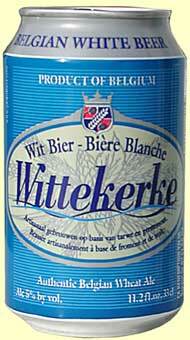 This is a refreshing, yet flavorful wheat beer. Aroma: NW hops, fresh, resin-like, citrusy. Appearance: Medium gold with a tiny amount of chill haze. Nice carbonation and head retention. Flavor: Medium hops in flavor and bitterness, rye, pancake-like, clean, good, light/medium mouthfeel, creamy, smooth. This is a really appealing ale. Aroma: Complex esters and malt, phenols, clove-like. Appearance: Golden in color with nice head. A bit cloudy, but attractive. Flavor: Not crisp, but creamy and fruity. There is a dry finish and spiciness in the flavor with alcohol hints. A bit syrupy with phenols, medium/full body, not cloying, light hops, complex. This is a very rich, complex beer. Appearance: Clear, pale gold, attractive. Flavor: A hint of wheat, honey is not apparent. Corn is present in flavor as well as aroma. Aroma: Perfume, citrus, mild aroma. Appearance: Dark gold -- darker than most Witbiers. Flavor: Light carbonation, floral, a bit light in flavor and complexity, acidity is low, a hint of orange. A very drinkable wheat ale. Aroma: Smells tart and spicy. Appearance: Nice glow, golden, beautiful and cloudy. Flavor: Tart, lemon-like, floral, spicy aftertaste, dry, light. A good example of the style. Aroma: Earthy, a bit stale, paper-like, lactic acid. Appearance: Cloudy, pale gold, light carbonation. Flavor: Lemon-like, sulfur, phenols, complex. This bottle could be a bit old. Aroma: Slightly floral, malty, slightly fruity, light hop aroma. Appearance: A bit cloudy, nice head retention, very pale gold color. Flavor: Wheat-like with phenols, not very clean fermentation, light in hops. Good attempt at a Koelsch, but needs to be more clean and delicate. Aroma: Floral, light, malty, a hint of butter. Appearance: Light gold, clear, nice white head. Flavor: A bit grassy, hops are too subdued, creamy, medium body, not really crisp enough -- a good Pilsner, nonetheless. Aroma: Piney, ginger overtones, plastic-like, lemon. Appearance: Darker gold, nice carbonation. Flavor: Lemon, tart, ginger, sour/ginger combination does not meld well. Spicy, lactic-like, interesting flavors. Aroma: Wheat-like, spicy, fruity, floral, very complex. Appearance: Huge white head that lingers, dark gold in color. Flavor: Dry, pepper, hop bitterness, spices, citrus, phenols, fruity, medium mouthfeel. A dry, mineral-like, peppery ale. Wild Wing Cafe is known for its outstanding beer selections!